Are you Ready to Sleep Like a Boss? One in three people struggle with sleeping. Are you one of them? You go to bed, exhausted and ready to sleep. But as soon as you lay down your eyes pop open. Your mind races, you toss and turn. You get out of bed the next morning and feel like you’re less than human. You’re tired, you’re crabby. You feel helpless and at the end of your rope. All you want to do is sleep like a normal person. Is that too much to ask? If this sounds like you, you can learn what’s keeping you awake and how to improve your sleep by tracking activities and habits that are sabotaging your sleep. GET MY DIGITAL JOURNAL NOW! The Therapeutic Sleep Journal & Workbook is a 1 month sleep journal to track your sleep stats, but it also tracks other factors that affect your ability to get a good night’s sleep. Tracking your daily habits, as well as how you’re sleeping will give you insights into what may be causing your insomnia. Even if you think you’re practicing good sleep hygiene doing everything right, a sleep journal often sheds light on bad habits you didn’t realize you had. Improving sleep isn’t something you tackle only at night before bed. Good sleep begins when you wake up in the morning. Sun exposure, the foods you eat, and even your attitude towards sleep all having a bearing on whether you have a good night or not. 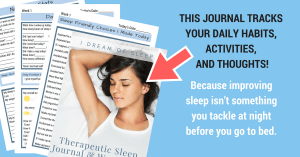 Daily Sleep Journal & Workbook: A therapeutic one month workbook to track and record your daily activities and mindset that may be affecting your sleep. Do you Worry about your Lack of Sleep? As someone who suffered from chronic insomnia for years, I also know how much your mind affects your sleep. From a racing mind to sleep anxiety and everything in between, what goes on between your ears can keep you awake just as much as drinking too much caffeine. That’s why I’ve designed this journal to address insomnia from the sleep anxiety aspect. Writing down your anxieties about sleep is just as important as keeping track of what activities you do leading up to bed. Journaling your worries materialize them into a tangible object, which helps to get them off your mind. Helps to shut your brain off and sleep. Teaches you to replace negative sleep thoughts and feelings with positive ones. Can’t wait to get your journal in the mail? Get the digital version! Download your journal and start tracking your sleep now!